Smart beta exchange-traded products (ETPs) saw assets under management (AUM) grow 28.4% to US$707 billion globally in the first half of the year, according to US-based Morningstar Inc, a provider of independent investment research. In Morningstar’s annual Global Guide to Strategic-Beta Exchange-Traded Products, it pointed out that 204 products were introduced in the market for the 12 months ended June 30. “This was slightly down from 211 in the previous year,” says the report. Most of the products were introduced in Europe — more than all the other regions combined. ETPs include exchange-traded funds and exchange-traded notes. The former tracks the index movement of stocks, bonds, gold or commodities while the latter is an unsecured debt note issued by institutions that investors can trade on the exchange or hold to maturity. Jackie Choy, Morningstar director of ETF research in Asia, tells Personal Wealth that the strong growth of smart beta ETPs in Europe is in line with the ongoing low-cost investing trend the region has seen in recent years. European investors have poured in more of their money into ETPs and are now asking for more sophisticated products that not only track market indices but also have factors that can enhance investment returns. The trend is also taking place in other developed countries, particularly the US, where more investors are investing in ETPs and demanding for more innovative products. “While the ETP industry in Europe is lagging behind the US, it is catching up and getting more sophisticated. The size of its ETP industry is growing and there are more new product offerings such as smart beta ETPs,” says Choy. Products such as multi-factor and low-volatility smart beta ETPs are some of them, he adds. Multi-factor ETPs track an alternative index that is structured based on factors such as growth potential and dividend payout ratio of a pool of stocks. Low-volatility smart beta ETPs track an alternative index that invests in a pool of stocks with low volatility and long-term growth potential. In Asia-Pacific, South Korea has the highest number of smart beta ETPs (52), followed by Australia (27), Japan (24), Hong Kong (15) and China (13). From an AUM perspective, Japan’s smart beta ETPs have the highest at US$12.503 billion. 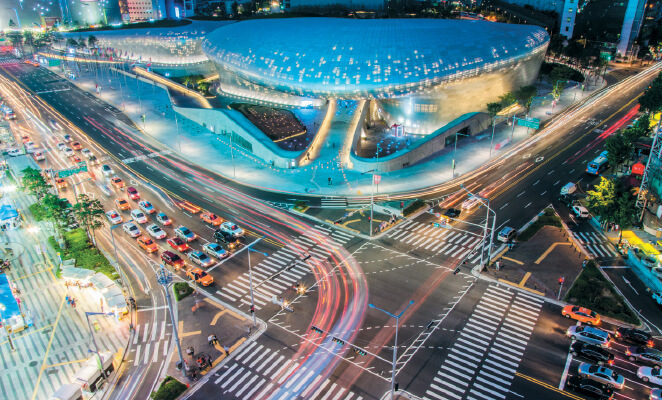 This is followed by Australia (US$2.232 billion), South Korea (US$969 million), China (US$414 million), Taiwan (US$364 million) and Hong Kong (US$230 million). 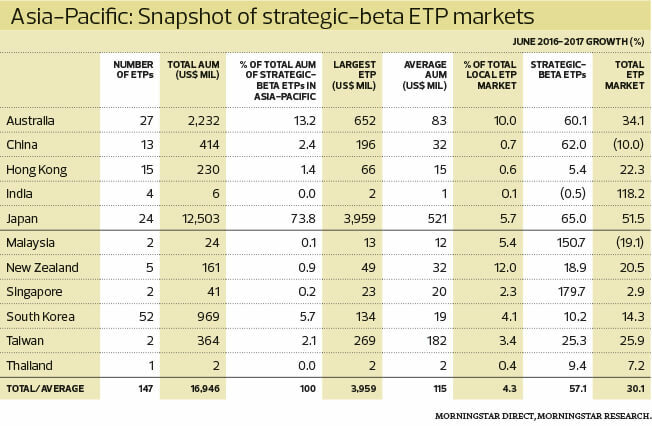 Malaysia has two smart beta ETPs, with total AUM of US$24 million. The two products being tracked by Morningstar are MyETF MSCI Malaysia Islamic Dividend and MyETF Dow Jones Islamic Market Malaysia Titans 25, both managed by i-VCAP Management Sdn Bhd. As at June 30, MyETF MSCI Malaysia Islamic Dividend had generated cumulative returns of 7.96% and 4.33% over the past one and three years respectively, based on its fund fact sheet. The fund charges an annual management fee of 0.4%. Meanwhile, the MyETF Dow Jones Islamic Market Malaysia Titans 25 had generated cumulative returns of 4.74% and -6.75% over the past one and three years respectively, based on its fund fact sheet. It also charges an annual management fee of 0.4%. Choy says it will take time for the ETF industry to gain traction in this part of Asia as markets in the region are less efficient than those in developed markets such as the US and EU. This allows the more active fund managers to achieve outperformance and justifies the higher fees charged by actively managed funds.